It was supposed to rain the whole week I was in Oxford. Fortunately for me, it didn’t. So each day, my friend Jill would pile us into her car and take us sightseeing. Living in Oxfordshire, she suggested a “side trip” to nearby Blenheim Palace, where Winston Churchill was born, and a variety of gardens could be seen. 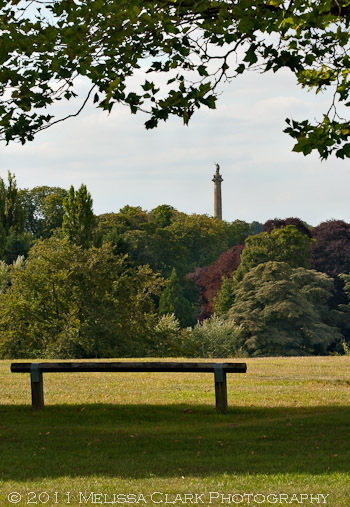 Approaching Blenheim, one can see the Column of Victory, which commemorates the Battle of Blenheim. 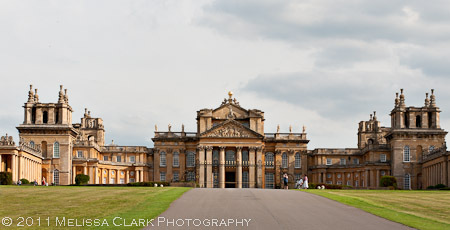 Somewhat overwhelming in scope, Blenheim Palace is called "Britain's Greatest Palace" in its 2011 brochure. Sir Winston Churchill was born here, and proposed to his wife on its grounds. A small bit of background: The palace was constructed around 1705; but the 2000 acres of parkland surrounding it did not come into their current glory until the arrival of Lancelot ‘Capability’ Brown in 1764. 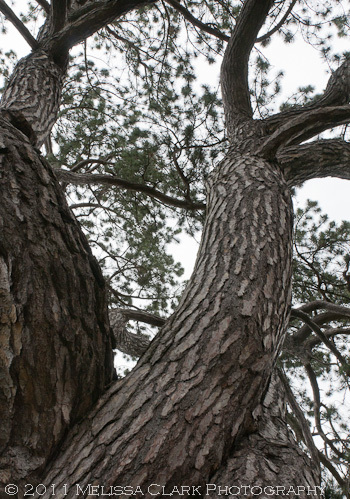 He was responsible for the creation of a giant lake, man-made undulations and a series of water cascades. 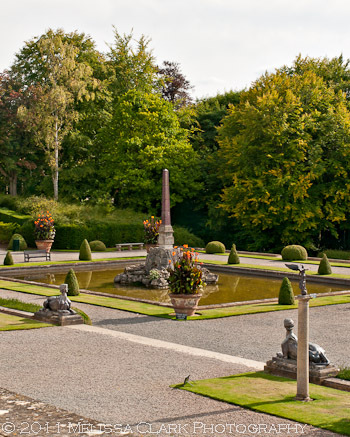 Churchill himself wrote that Blenheim’s unique appeal lay in its perfect adaptation of English parkland to an Italian palace. The “Italian palace” reference seems peculiarly relevant to the part of gardens I saw – the western water terraces, designed by the French landscape architect Achille Duchêne. On a second terrace below the upper terrace were placed two great fountains in the style of Bernini, modeled after those in the Piazza Navona. The lower water terraces in late afternoon light. 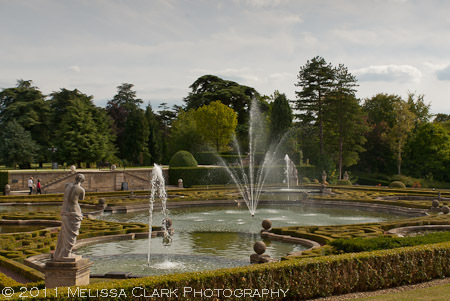 The water terraces took five years to build, from 1925 to 1930, during the stewardship of the 9th Duke of Malborough. The sphinx sculptures seen in the photo above have heads modeled after Gladys Deacon, his second wife. As I walked around, appreciating the late afternoon light and trying to keep stray tourists out of my camera’s viewfinder, I was struck by two thoughts. The first one was how unexpectedly much I liked the lower terrace area, in particular the choice of electric-orange cannas for the large urns anchoring the corners of the pools (who knows what these containers hold in other seasons?). The second was how incredibly different this garden is from Chartwell, Churchill’s personal, country home and garden, with its walled garden spilling over with classically British, lush, herbaceous borders. He loved both, but I like to think he loved Chartwell more. 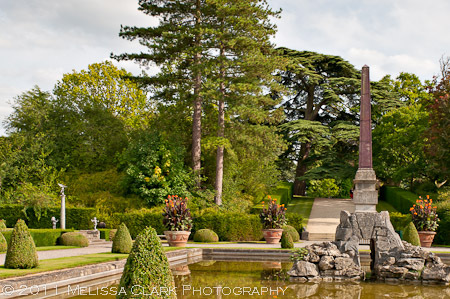 For more information on the gardens at Blenheim Palace, please visit its website. I’d love to go back and explore the Secret Garden, the Temple of Diana (where the Prime Minister proposed to his wife Clementine), and the wide scope of Capability Brown’s work. 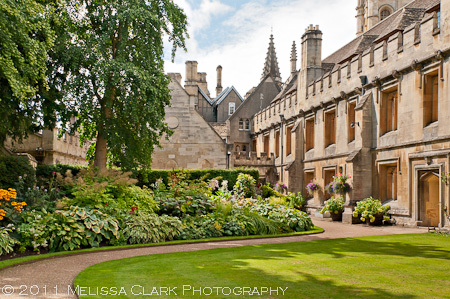 In my last post, I shared some images from the “inner” garden areas at Magdalen College in Oxford. 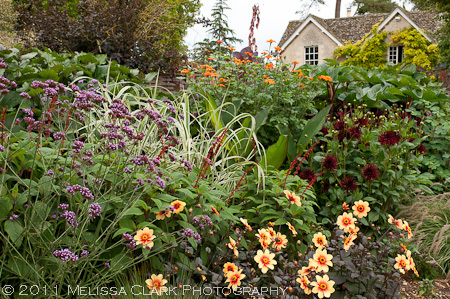 Beautiful, lush late-summer borders, meticulously maintained, and so forth and so on. The friend who toured me around, however, had other parts of the grounds she wanted to show me. So we passed through those beautiful blue iron gates and out to Addison’s Walk. The Walk is hushed and meanders along two routes. We took the one that leads to the Fellows’ Garden. En route we spied a meadow which famously houses Magdalen’s Deer Herd. 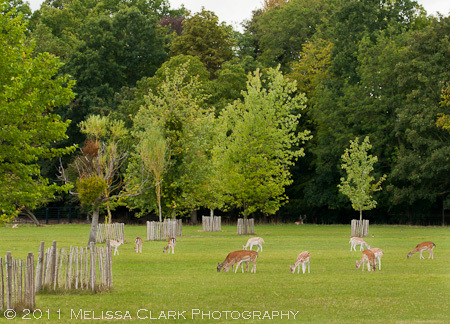 Deer grazing in Magdalen College's Deer Park in August. The Deer Park or Deer Grove is home to approximately 60 deer, which graze in the meadow from mid-July to December. Here, of course, I would have cursed them roundly and muttered imprecations about the damage they can and will do to my garden. In the Park, however, they seemed positively bucolic and appropriate. (I’m sure they are never allowed inside the blue iron gate to munch on the herbaceous borders I saw). A middling-sized iron fence keeps them inside the Park, but its height wouldn’t stop them if they wanted out. On the other hand, with a life as idyllic as theirs, why should they want to leave? 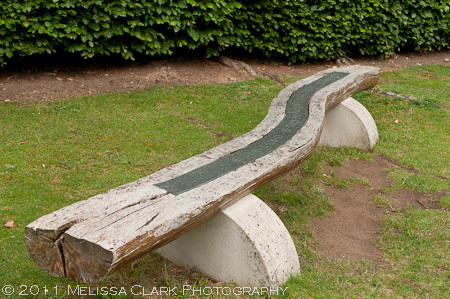 and a beautiful, hand-carved wooden bench (with an inlaid quotation) in a sinuous shape. It was a sculpture that we saw on the way back, however, that I found the most arresting. Ten metres high, a steel tree-shaped form presides over a meadow (Bat Willow Meadow, to be precise). 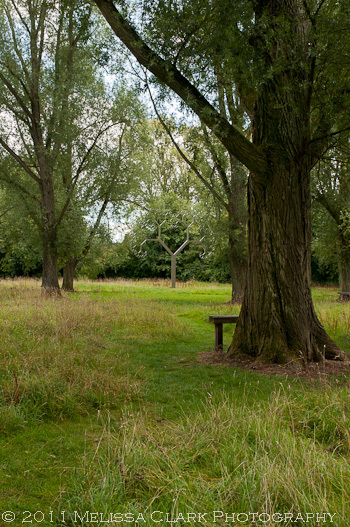 The sculptor, Mark Wallinger, created it as a commission to commemorate Magdalen’s 550 anniversary. 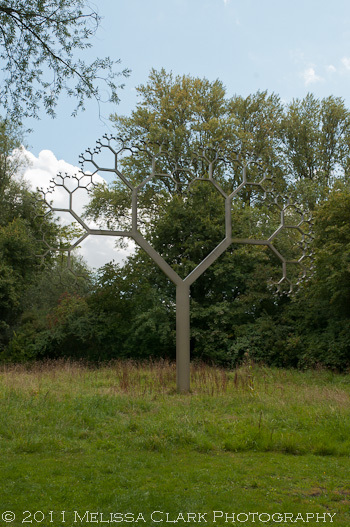 The sculpture is difficult to photograph because the polished steel is hard to distinguish from the background of the meadow’s trees, and the edges of the “tree branches” are finely wrought in their design – to evoke, the sculptor has said, the shapes of deer antlers on the College’s nearby herds. Y's "branches" suggest the curved horns of deer, in honor of Magdalen's Deer Herd. 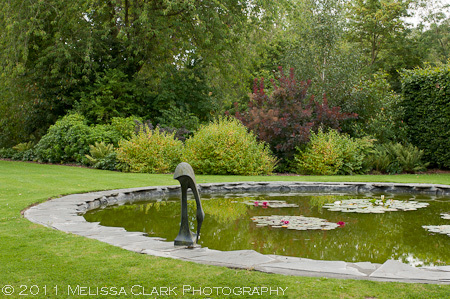 The sculpture’s setting, however, is perfect – no busy “gardenesque” plantings, just simple meadow grasses and a few wooden benches here and there. A lovely spot for a picnic, or quiet conversation. For more information about the sculpture visit Magdalen’s website or Wallinger’s “microsite” there. Right across from the Oxford Botanic Garden lie the hallowed grounds of Magdalen College, one of Oxford University’s most renowned colleges. The college is over 550 years old and counts among its alumni nine Nobel laureates and numerous other notables. But it was its extensive grounds and the wide variety of its landscapes that fascinated me most the day I visited. 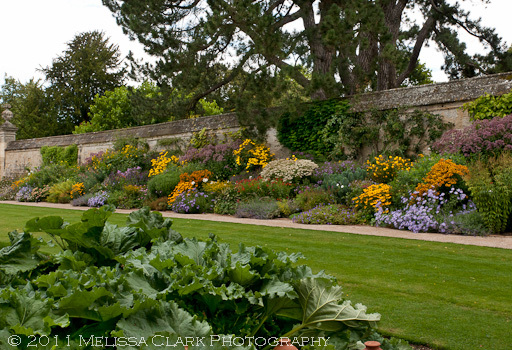 Part of the sunny herbaceous borders on Magadalen College's grounds. Same border, wider view. 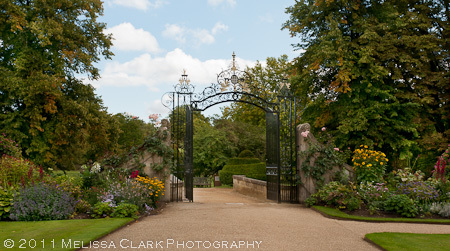 The gate leads to the outer grounds and the Deer Park. and part shade in its composition. The shadier part of the main borders. 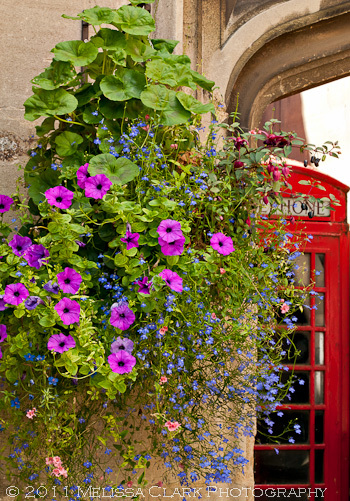 I even spied a throwback to an earlier time – a bright red telephone box, next to one of Oxford’s ubiquitous and beautiful hanging baskets. These borders flank a gate that leads out to the more bucolic parts of Magdalen’s grounds (more about which in the next post). But wandering around on my own in the Cloisters building, I saw crews pruning massive wisteria on the interior walls – and a serene, carefully composed planting scheme of Annabelle hydrangeas still looking quite fresh below them. Wisteria and Annabelle hydrangeas create a rhythmic pattern in the Cloister quadrangle. That’s all this time – next post, a look at an intriguing steel sculpture in another part of the College grounds, and its deer park . 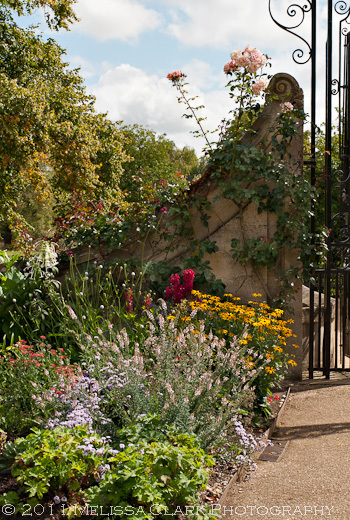 . .
For an interactive “virtual tour” map of Magdalen’s grounds, click here. While I wait for spring to arrive, I’ve been spending some time looking at my photos from my trip to English gardens in 2002 (or thereabouts, my mind is like Swiss cheese these days). One of the gardens/historic sites we visited was Churchill’s home in Chartwell (in Kent). 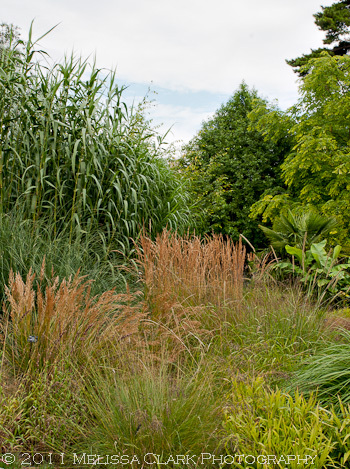 I remember thinking at the time this destination was announced that it couldn’t be a serious garden – unless his wife had been a devoted gardener. While I have only a few images from that day, they do bring back memories of stunning vistas from the terraces behind the house and delightful surprises, both anecdotal and visual. 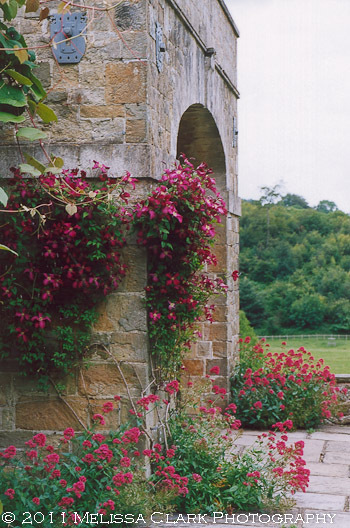 Valerian and red clematis on a stone arch on one of Chartwell's upper terraces. According to what seems to be the official Churchill website, Winston Churchill bought Chartwell in 1924 for its impressive views. Over the next 15 years, he spent considerable amounts of money on both the house and garden. 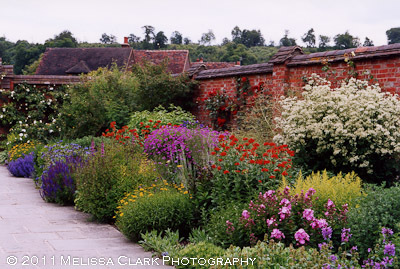 There is a walled garden, generously planted in the cottage style, whose brick walls he apparently helped build himself. 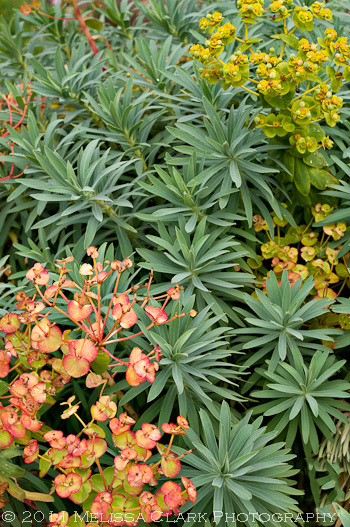 Exuberant cottage-style plantings in a section of Chartwell's gardens. 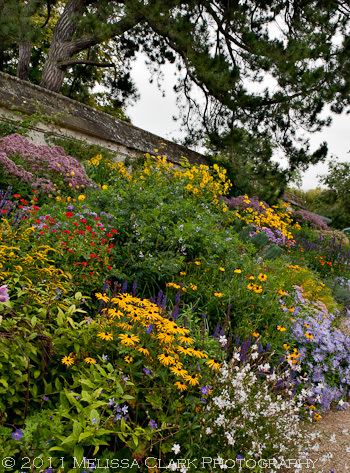 One of the most famous parts of the garden is the Golden Rose Walk, a gift from Churchill’s children to him and his wife Clementine on the occasion of their golden wedding anniversary in 1958. 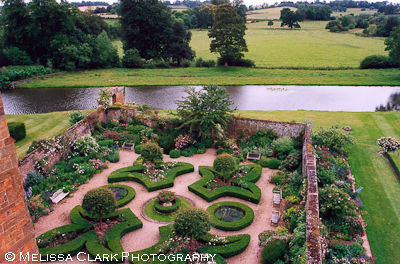 A view from above of the Golden Rose Walk in June. 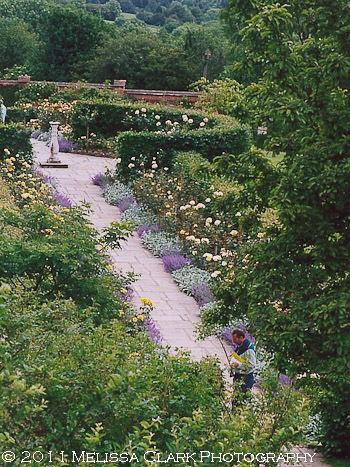 According to the website, there are over 1000 rose bushes at Chartwell. Lady Churchill loved having cut flowers in the house, and we saw plenty of roses, as well as other flowers, in the arrangements inside the house – as well as out in the gardens. In 1945, the expense of maintaining Chartwell was troubling Churchill. A group of wealthy friends arranged to purchase the property and donate it to the National Trust (which maintains it today), with the stipulation that he be allowed to live in it at a nominal rent until his death. In 1966, one year after his death, Chartwell opened to the public and remains open to visitors today. Visit it if you can. 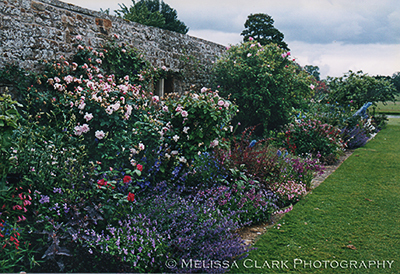 I was digging through my stash of scanned photos from my English gardens trip the other day and stumbled across some from Broughton Castle, which I wanted to share with those of you who might not have heard of it. Broughton Castle is still the home of Lord and Lady Saye and Sele, who have furnished some of its 16th-century bedrooms with pieces of contemporary furniture. Their ancestors were Roundheads in England’s Civil War, but opposed the King’s execution – so their lands were returned to them when Charles II returned to the throne. 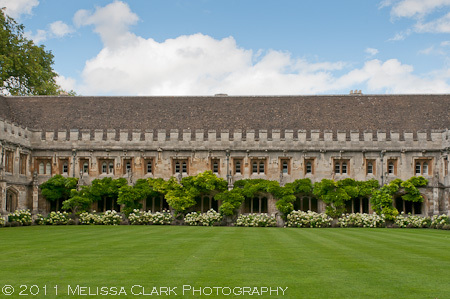 Chances are, you have seen Broughton’s Great Hall without realizing it – because it was used in filming the scene from the film “Shakespeare in Love” in which Viola de Lessops (Gwyneth Paltrow) dances with the young Shakespeare (in other words, it stands in for her family home – not too shabby). 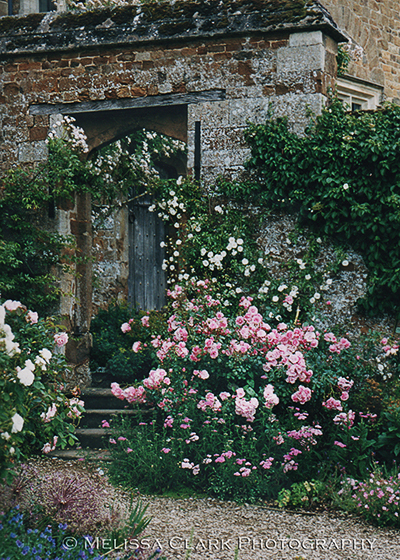 Roses next to the entry to a walled garden at Broughton Castle. over walls, and in the Ladies’ Garden (see below), I started thinking more positively. 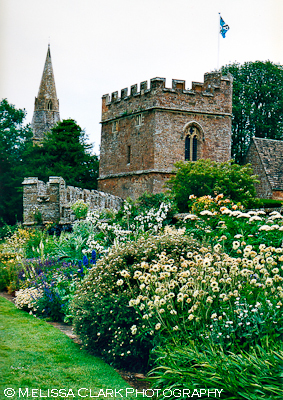 The walled garden on the south side of Broughton Castle, known as the Ladies' Garden, was established in the 1880s on the site of the sixteenth century kitchen. The fleur de lys beds are planted with Rose 'Heritage' and Rose 'Gruss an Aachen'. Lady Saye and Sele, who was actually grubbing around in the garden with nary a gardener in sight the day we visited, was sighing over some David Austin roses which she felt weren’t doing well. Someone had told her that because the existing roses were diseased, she would have to replace the soil before she could plant more roses. I quickly resolved that any roses I planted would get one, and only one, chance since soil replacement wasn’t something to which I wanted to devote precious gardening time. 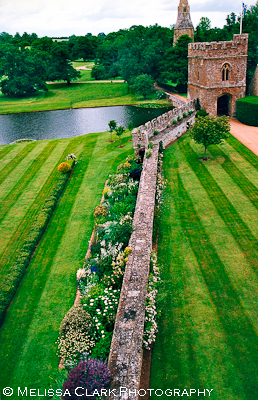 The gardens at Broughton Castle were originally designed by the American designer Lanning Roper. The borders outside the castle walls were really stunning. But it was the views from the castle’s Tower which took my breath away. What a great job with mowing the lawn! Love those stripes. 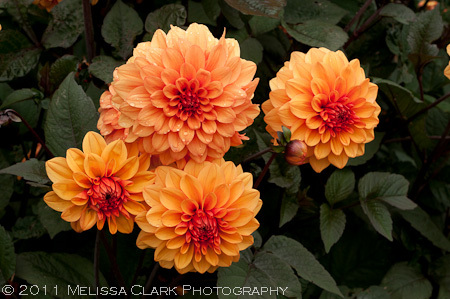 Posted from Wayne, Pennsylvania, where I am taking part in the annual Master Garden Photography workshop this weekend with Roger Foley & Alan Detrick. I promise a longer post next week!